Day 1 : We will meet at 9am at our snowmobile rental center, located at Sainte-Marguerite-du-Lac-Masson. You will file some formalities such as rental agreements. Then, you will receive your snowmobile equipment and learn some security rules and driving advices. You will also receive training from your guide, and then be able to explore and enjoy the Quebec network of trails. During this first day, you will cross several snow-covered lakes ad forests. 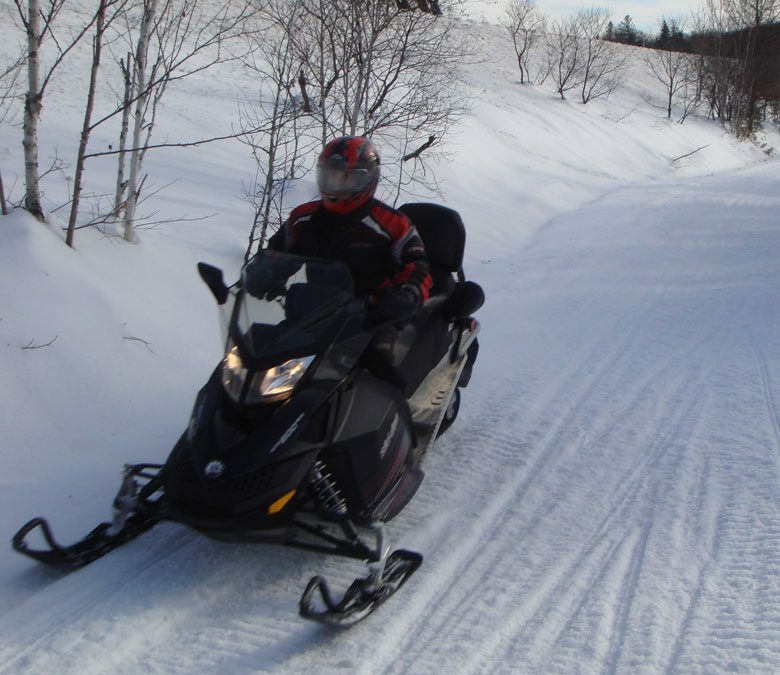 While driving your snowmobile for three kilometers across the Lac-des-Iles, you will enjoy the vastness of the area. You will reach the beautiful suspension bridge of Notre-Dame-de-la-Merci. Midway through the ride, you will take a break for lunch in a typical village restaurant. At the end of the day, you will come back to the center and then you will drive to your Inn where you can relax, have a good dinner and sleep. Day 2 : After a great traditional breakfast, you will begin a journey towards the wild and steep landscape of the Montagne Noire. There, the trees are named “mummies” because they are wrapped in a mixture of snow and ice, which creates a magic atmosphere. You will see many wild animal tracks. At the top of the mountain, if you are lucky, some Quebec grey jays will come to peck in your hand. At the end of the second day, you will come back to your center where you will remove your snowmobile equipment. Drive to your Inn and have a comfort dinner and sleep. Day 3 : after a hearty traditional breakfast from Quebec, you will go to the center to do dog sledding. You will enjoy large spaces and discover new sliding sensations. At the end of the experience, you will have the chance to thank your guide and pet his dogs after this beautiful morning. This snowmobile has comfortable seats, heated grips for driver and passenger. If you prefer a snowmobile with 90hp, you can rent the Bombardier 900 ACE, same but more powerful. people, the sled will be a little bigger and you will be two sitting the sled and one that leads, with the possibility of exchanging places during the ride. The equipments for the driver and passenger for the duos (helmet, snowmobile pants and jacket, boots) for snowmobile activity.